I had the pleasure of helping a friend out who needed an extra pair of hands when there was a sudden surge in business due to an outdoor event held right across the park from where his food truck is located. He was just getting ready to shut up shop for the day when a long, long queue began forming as the sun started setting and I think he made more in that one night than what he usually makes in an entire year. Apparently you have to get permission to sell at specific outdoor events which are in themselves registered with the district city council, judging in part by the fact that there was a good police presence to keep an eye on proceedings. Serving hot dogs and the occasional taco variation made for a nice change from the high pressure environment I ordinarily have to endure as a professional chef, but I reckon there’s a gap in the market for more “authentic” foods to be sold off of food trucks. Of course I manned the truck while my buddy went to stock up on more ingredients, a trip he’d subsequently have to make two more times during the night, which entailed waking up his regular suppliers. Of course they couldn’t say no to money knocking at the door (kind of like an unexpected little tax refund) and were only happy to get up and fulfill the bigger-than-usual orders. So I guess my one night thrust into the food truck business taught me that it’s all about location. Yes, a good spot which makes for more of a permanent point from which to sell the food you offer goes a long way in making sure you can rake in some consistent earnings from regular customers, but I reckon there’s a gap in the market for a different model. If you like to travel for example and you have a high tolerance for the noise and all the other shenanigans which come with outdoor events, perhaps you could operate a mobile food truck that follows the fun. Party goers will always need some spot to fill up at, as is the case with all people so you’ll never be short on customers. 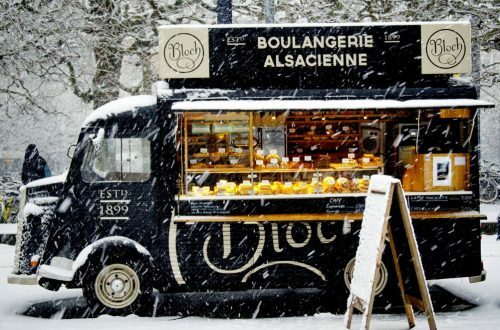 Naturally you’d have a lot more paperwork to have to sort out with each event you follow with your food truck, but that’s perhaps a price you’d be willing to pay if it means that you can enjoy traveling while making money at the same time.